Finding the joys, challenges and frustrations of being a learner, a teacher, and an explorer in this wild ride of being a middle school educator. I co-authored this with Beth Holland (EdTechTeacher). It was originally posted on Edudemic.com on 5/21. Teachers can change the world. As the week of MCAS hell rolls to a close tomorrow, it would be easy to forget our role as teachers and potential heroes. We can’t forget this because we are, or at least, we can be. If there is any doubt of the power a caring educator can have on the lives of young people, watch this ESPN short about the Lady Jags, the girls basketball team of Carroll Academy. Carroll is a non-residential juvenile detention facility. The team has lost more than 200 consecutive games, and not by small margins (scores such were sometimes 91-4); yet this short is not a “Cinderella Story” but a story of the potential of all children and the value of an education and adults who believe in them. Listening to the coach talk with his team, I don’t hear condescending tone or misleading messages. The coach accepts the girls for who they are and is determined to help them succeed. At the end of the film we watch the season come to a close with another loss, but this is not the fact upon which the coach focuses. He assesses the team and their success not on a score, but on the progress each of these girls has made. Achievement is evident in the girls’ body language and their dedication on the court. Despite the lack of “Cinderella victory” we watch these girls win and succeed. As teachers we foster this type of achievement every day. Every day teachers accept the challenge of helping kids learn and grow. We hope that our students are not faced with the same challenges that many of the Lady Jags face, but regardless, as teachers we accept the challenge to help them learn and grow into the citizens and human beings we know they can be. We see who they are when they enter our class and we support them as best we can to win at life. A standardized test cannot be the measurement, just as a scoreboard at the end of the basketball game could not measure the success of the Lady Jags. On Sunday night I jumped in on #edchatma. 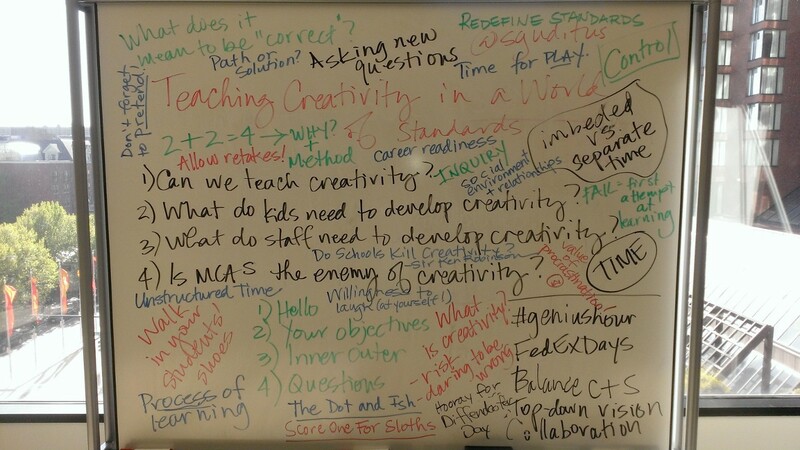 I was still on the extreme passion high from Edcamp Boston and wanted to further the conversations started on Saturday. During the chat, someone asked what made #edcampbos such a special event. I tried to capture it in 140 characters, but it just is not possible. On Monday morning I saw a tweet urging Edcampers to share not just that we learned, but what we learned. 1. Student voice is extremely powerful. 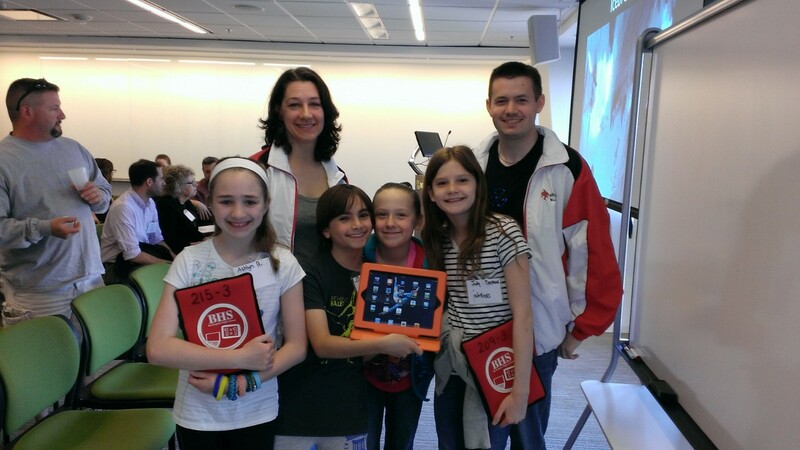 Edcamp Boston participants had three opportunities to engage in sessions led by students. It was the highlight of the day for me. A group of 5th grade students from Pine Glen Elementary School in Burlington blew me away. Of course their knowledge and creativity was engaging, but to me it was the thoughtful and eloquent way in which they responded to questions and added their own ideas that I found the most incredible. Ten year olds that handled themselves better than many adults I know! Cramming math facts or force feeding content is not the answer. Letting kids create and explore, then share their knowledge and learning, this is the transformation that needs to occur. Bethany Rogers joined Katrina Kennett again this year after wowing the crowd last year at Edcamp Boston. Erin McGurk’s tweet below shows perfectly the impact Bethany had on the educators in her session. 2. In the midst of the morning schedule build, I was chatting with fellow organizer Liz Davis about the sessions she was putting up. She told me that she had a new name for 21st century learning, “I call it today.” I laughed, but it was not out of humor. I am growing more and more tired of the term as it is continually being used as a term to denote some goal we are striving to reach. We are 13 years into this century. Jobs, skill sets and lifestyle have transitioned, why is it okay for schools and educators to act as if it is understandable that schools and educators have not kept pace? It is unlikely that I will be able to fix this problem in the short term, but at least I can help reposition the lingo. No more 21st Century spoken like it is sometime beyond, it is TODAY. Thank you Liz Davis. – Rumor has it that Steve Guditus was responsible for this board! 4. In the afternoon I had the privilege of hearing a 9th grade student, Sam Mahler, eloquently testify that students should not have to fight to have access to tools that allow them to learn. Sam is both dyslexic and disgraphic, but with the help of the amazing Karen Janowski and incredibly supportive parents, he has learned to use the iPad as a tool to allow him to overcome the challenges that his learning disabilities present, making it possible for him to engage in his education. The quote that most impacted me was when Sam Mahler discussed the impact of taking the iPad away from him for assessments in school. “I am an A, sometimes a B, student on projects and assignments. I am a C or D student on tests and quizzes…they are keeping me from Harvard.” Wow. How can educational institutions continue to allow this to happen? 5. Learning and sharing is exciting and there is no better form for a teacher than an Edcamp. I work with some incredible teachers in my school; however, all too often when we gather for “professional development” time, our time is distracted by discussions/complaints of a new policy or new initiative. The atmosphere often turns toward pessimism. Not at an Edcamp. I saw this post from Christine DiMicelli and could not agree more. Edcamps are engaging and enlightening. Edcamps are inspiring and they are thought-provoking. On a clear and beautiful May weekend, dedicated teachers filled the rooms at Microsoft and the atmosphere was electric. Below is what I wrote before heading off to sleep on Sunday. Hope to see you all at Edcamp BLC in July! The opposite of growth is death.